The fourth edition of "Rio Sabor & Arte" happens this weekend, taking gourmet culinary stalls and live chorinho and samba music to Praça Santos Dumont. RIO DE JANEIRO, BRAZIL – This weekend, October 14th and 15th, the cultural event “Rio Sabor & Arte” (Rio Flavour & Art) returns to Zona Sul. 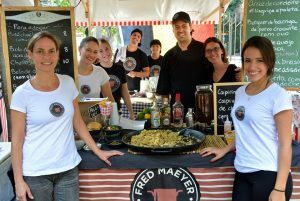 The fourth edition of the free cultural fair will take place at Praça Santos Dumont, in Gávea, and includes Brazilian music bands, artisanal beer and culinary stalls from 12PM to 10PM. Belgium chef Frederic Maeyer will be participating at Rio Sabor & Arte with his food truck, photo internet recreation. Rio Sabor & Arte is known among Zona Sul’s residents for gathering the best of Rio’s street culinary and artisanal beer labels with good quality music, always in outdoor public places. On Saturday, October 14th, the Licor do Canavial band will run the stage at 8PM. Composed of Felipe Lauria (voice and electric guitar), João Mattos (voice and guitar), Caio Barreto (electric guitar), Gabriel Carvalho (voice and bass) and Léo Novo (drums), the group will present renditions of MPB, pop and rock music. Opening Sunday’s line up, on October 15th, will be General Glicério’s “roda de choro”, which will start at 3PM. This “roda de choro” takes place every Saturday afternoon at Rua General Glicério, in Laranjeiras, being one of the neighborhood’s residents favorite program for listening to good music in a chilled, outdoor environment. Later on, the Rebarbas’ “roda de samba” will be in charge of the live music, performing at 6:30 PM. Rebarbas is one of Botafogo’s most traditional carnival blocs, and will present both samba classics and typical carnaval songs. Conceived by the culinary curator Gueta Ridzi, “Rio Sabor & Arte” offers the best food trucks for all tastes, including Risoteria’s Ialian risotto, Vulcano’s homemade burgers, Espírito de Porco’s pork-based dishes, Fred de Maeyer’s Belgium food and Paradis Macarrons’ French sweets treats. Various artisanal beer labels, like Mistura Clássica, Allegra, Backer, Noi, Hop Lab, Hocus Pocus, Thirsty Hawks Farm Brewery and Capa Preta, can also be found at the event, with prices varying from R$4 to R$30. What’s more, the event will promote activities for children, whose day is celebrated today, October 12th. Storytelling, games with recreational group Bolhas Gigantes and a bouncer jumper are some of the attractions they can enjoy at “Rio Sabor & Arte”. A pet adoption fair will also be happening on both days from 1PM.